When it comes to animals rescuing human life, the majority would jump up and point to dogs! Dogs are indeed, have well established their fame as rescuers and man first protectors through the long journey they had with the two-legged friend. Yet, Dogs cannot enjoy this favor alone! In our list today, we introduce the top 10 cats who saved human life, and it goes without saying that this list by no means a final one; as there are hundreds of similar hero cats stories! This is one cat with a nose for heroism. Trudy and Greg were in deep sleep in the middle of a cold October night when Schnautzie jumped onto their bed and started tapping Trudy's nose. Trudy tried to ignore the paw on her face but this cat was nothing if not persistent. Immediately, Trudy woke up and turned the light on to chastise her cat. That's when she saw that Schnautzie was sniffing the air constantly. And what was that faint hissing sound? It turned out that a gas pipe leading into the household was ruptured leaking gas into the basement. The fire brigade was called and the guys got out only to find out that if they hadn't been so rudely woken the gas would have soon reached the furnace and they'd have all gone up in flames. this tabby may have no claws but he's got plenty of moxie. After all he’d need some to take on a black bear single-handedly. This mighty warrior spooked the bear when it had the gall to wander into Jack's backyard in 2006. Jack's owner was shocked when he came out to see the bear terrified and forced to climb to the top of a tall tree;and at the base of the tree sit conquering hero Jack. Here comes a rescue cat who is taking to rescue her owner on a regular basis. When a family took in pretty typical decision to shelter this amazing cat from a rescue center they didn't realize how much of an impact the black and white feline would have on their lives. Schoolgirl, Mia, has type one diabetes and pretty Pippa has a seemingly magical ability to sense when Mia is about to suffer a hypoglycemic event at night. The extraordinary Pippa would run into Mia's parents room and walk all over them until they wake. Amazingly this has happened 20 times and each time it has appeared that Mia's blood sugar levels were beginning to drop dangerously low. While there are dogs that have been trained to recognize the signs of a human being entering hypoglycemic shock, pretty Pippa seems pretty unique among felines; hopefully she's the first of many. When a thief was threatening to kill himself in a tense standoff with police there was only one four-leg hero who could talk him down. After being caught in a stolen car a man ran into a nearby building and up to the third floor where he promised to dash himself on the pavement below. What followed was three hours of negotiations, but it was a member of the man's family who suggested collecting the thief's beloved orange cat to the scene. The sight of the animal convinced the man to step back down from a window ledge and join the officers on the street below. Poor Homer, the cat, had some bad luck early on in life when an eye infection forced the vet to remove his eyes to save his life. Thankfully, he was adopted by a kind-hearted woman Gwen who gave him the name Homer after the famous blind poet. Three years later, Homer returned the favor when she awoke in the middle of the night to hear Homer yelling terribly. The reason there was an intruder in Gwen’s room. Luckily for Gwen she had Homer on her side. The cat left across the room and attacked the intruder biting and hissing until the man turned tail and ran. Even better, Gwen told Homer story in a best-selling book called Homer's Odyssey and in, so doing, encouraged the number of people adopting blind cats to shoot up dramatically. Everyone who has ever lived in an apartment complex knows that there's always at least one resident cat who claims the stairwells as their own. In Russia one such apartment block has Masha and boy aren't they lucky. One freezing day a resident heard Masha’s plaintive meows carrying through the hall and upon following the sound found Masha sitting in a cardboard box. But what was in there with the long-haired cat was a huge surprise! Masha was taking care of a twelve week-old baby trying to keep him warm while simultaneously trying to attract attention! Thankfully Masha managed to prevent the child from going into hypothermia and the boy was fine. Residents remarked that given the low temperature that day, if Masha had not been on hand to keep the baby warm he would have almost certainly died. Meet Fridge! She can detect cancer! Owner Wendy Humphreys thought it was very strange that her new kitten decided that at eight weeks old she would start jumping onto Wendy's right breast whenever she had the chance. Every time Wendy sat Fridge pounced! She did it so often that Wendy's breast actually began to bruise, at which point she visited the doctor who detected a lump. Thankfully, while the lump was malignant, it was detected so early that Wendy could be successfully treated. As for fridge, as Wendy put it, “she saved my life definitely. I was told that if I hadn't been diagnosed that early, I could have died”. The middle of the ocean doesn't seem like the natural place for a cat to live but that's where a black and white hero cat, Major Tom, lived with his human master, Skipper Grant McDonald. Their yacht, the Osprey, began taking on water one September morning, but Grant didn't know it because he was sound asleep. Fortunately, Major Tom was there to insure the rescue! Grant awoke to find his cat head-butting his nose and water rising fast. The dynamic duo had enough time to jump in a life raft and roll off to safety. Our number-one entry on the countdown of cats who saved human lives has to be Tommy, the cat who managed to call 911 when his owner was in danger! Gary a longtime osteoporotic sufferer fell out of his wheelchair and couldn't get back up nor could he reach his emergency medical alert necklace. Somehow though, an emergency phone call was made! 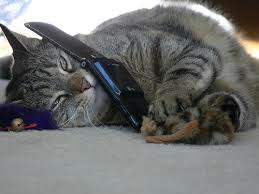 When the police arrived they found Tommy, his cat, lying next to a phone which was off the hook. There was no other explanation as to how 911 was dialed! Gary later explained that he had previously attempted to teach his little feline hero how to hit the emergency call button but he wasn't sure the knowledge had sunk in until that day.